The War That Saved My Life by Kimberly Brubaker Bradley. Grades 4-7. Dial Books, January 2015. 320 pages. Review copy provided by publisher. Ada is 10 years old and she’s never been outside of her family’s one-bedroom apartment. Born with a twisted foot, which her Mam calls the mark of the devil, Ada is not allowed to be seen by other people. Her Mam doesn’t let her go to school and has never bothered to help her learn to walk - Ada has to crawl around their apartment. Worst of all, when Mam is angry at her, which is pretty often, she shuts Ada up in a damp cabinet with the roaches for hours. World War II is brewing and the children of London are being sent away from their parents to live in safety in the country. When Mam decides to send Ada’s younger brother Jamie away to safety, Ada sees her chance. She teaches herself to walk - very painfully - and she sneaks out to join her brother. They’re sent to the English countryside and taken in by a lady named Susan, a lady who never wanted children but feels it’s her duty to help out in wartime. For the first time, Ada gets crutches so she can walk, she learns how to ride a horse and even to read… but she knows that at any moment Mam could change her mind and everything could be taken away from her. There is so much to love about this book, but what I loved most of all is the complicated characters that Ms. Bradley has created here. It's one thing for siblings to experience abuse together, but it's a completely different animal when one sibling suffers abuse and one does not. Ada loves Jamie and wants to protect him more than anything, but as the younger sibling, Jamie cannot reciprocate and he doesn't even see some of the abuse that has been going on. When Jamie gets homesick and longs to go home to Mam, Ada cannot understand how he feels because she is so grateful to have escaped. Logically, she knows that life in London was different for Jamie, but emotionally she cannot identify with what he's feeling. At the same time, Ada cannot trust in what's happened to her. Sure, life is way better in the countryside, but Ada is very guarded. She knows that at any moment her new life could come crumbling down around her. Her emotions are overwhelming and often volatile... and through it all, Susan is steadfast. Susan is suffering her own loss. We learn by bits and pieces that Susan is mourning the death of her "good friend" Becky whom she lived with. Becky was obviously someone very important to Susan and we see how having the children around, having others to care for, having someone to come home to is helping Susan deal with her grief. I just couldn't get enough of these characters and I loved learning their stories and seeing them grow and change. This is also a great World War II story from a perspective - the English home front - that many kids may be less familiar with. Details bring this historical setting to life - blackout curtains, victory gardens, air raids, and more. And it's even a sneaky kind of horse book! 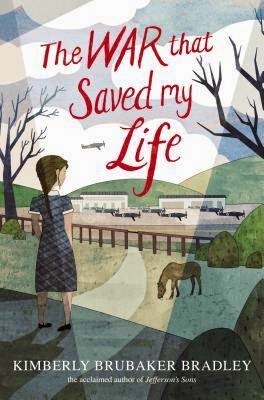 It may not be enough of a horse story to satisfy super fans, but there are definitely plenty of details about Ada learning to ride and taking care of Susan's pony which had been neglected after Becky died. Hand this one to kids who love to read about a character they can root for or kids looking for great historical fiction, particularly war home front stories or World War II. Half a World Away by Cynthia Kadohata for its emotional and authentic portrayal of an adopted boy struggling to adjust to life in a new world. One for the Murphys by Lynda Mullaly Hunt for a foster kid protagonist who is easy to root for. Books about the WWII home front.